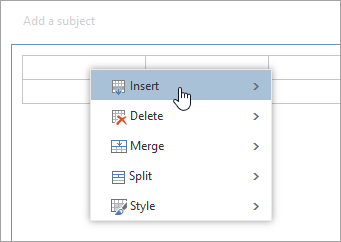 You can insert a table in your Outlook on the web email messages or calendars to help you organize your data. The instructions are slightly different depending on whether you're using the new Outlook on the web. 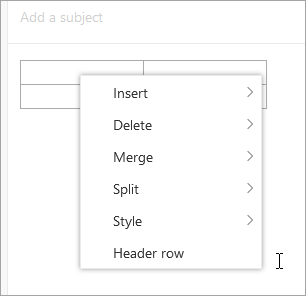 Choose which version of Outlook on the web you're using to see the steps that apply to you. See Instructions for the new Outlook on the web. See Instructions for classic Outlook on the web. Note: If your organization has included its logo in the toolbar, you might see something slightly different than shown above. Create a new message or reply to an existing message. At the bottom of the compose pane, select > . Drag the pointer to choose the number of columns and rows you want in your table. Right-click a cell in the table. At the bottom of the compose pane, select . If you don't see the icon, select > .